The Last First Wednesday 2018! Another year of First Wednesdays has happened. It’s time to wrap up 2018 and prepare for the new year. So let’s do it right. 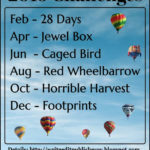 Challenge yourself to visit ten new blogs on the IWSG list this month. Encourage those bloggers to do the same. Get ready for the #IWSGPit in January. The question is always optional. The awesome co-hosts for the December 5 posting of the IWSG are J.H. Moncrieff, Tonja Drecker , Patsy Collins, and Chrys Fey! There’s usually something to drink while I’m writing. Depending on the time of day it’s water, coffee (cappucino), mint tea, wine. That kind of sums up about eight hours of imbibing and working at my desk. Noise silencers like those airline give to their employees on the tarmac have become a regular feature since my closest neighbor has purchased a leaf blower with an obnoxious noise and likes her driveway pristine–impossible in a forest, I might add, so she blows a lot. Because it’s usually very quiet where I live, this blower sounds even louder. Outside of those items, it’s just me, my keyboard and the monitor. An essential writing trinity. 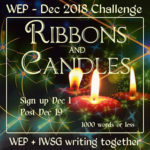 It’s time to sign up for the December WEP, and the 2019 WEP Themes are up for you to see. They are wonderful and Olga Godim’s badges are beautiful. Be sure to visit and see all of them. 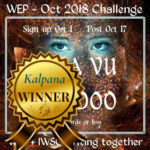 And did you read the winning October WEP? We have two other winners to announce as well. Tryrean Martinson’s entry called Footprints won our theme contest here at Camp IWSG. Congrats, Tyrean. And Toi Thomas won the February WEP theme challenge with 28 Days. She’ll appear in the next IWSG Newsletter! On my homefront I have a few interesting things happening. All of my middle grade books are now comfortably tucked in on the shelves of Riverhouse Books in Carmel. Monterey County boasts several Indie Bookstores, and each is a treasure. My second reader/editor gave my latest YA a lot of help, and I’m digging into the edits between the holidays. I still have no title, and one doesn’t seem imminent. My Email Connect is featuring Jemi Fraser this month. Variety! Keeps me interested in sitting in one spot when I have writing to do. Our neighbors must be cousins. Mine is constantly making everything about her yard and driveway pristine. It is exhausting to listen to- as she has workers at her house daily blowing leaves, cutting grass, trimming hedges, etc. It starts at 8am and goes on and on. It’s been going on for over a year. I hope she settles down soon- the noise is exhausting. Your noise silencer sound interesting. I need something like that. Congrats on your books being on the shelves in Carmel. That is fabulous! Waiting on your December WEP story!! I finally got it up yesterday. Whew! This month is crammed. Here’s to a slow January. I am? This will be a first. Thank you for telling me. Good luck with the cover contest and best of luck with the edits. Thanks. Even if I don’t win, the cover gets a lot of exposure. Hope your Christmas or whatever celebration you choose is great. Oh god… leaf blowers. You have my sympathy. I hope I’m still in time for Cover wars – I used to love doing that! I hope you jumped in, Jemima. It is fun. A noisy leaf blower. How awful. Glad you found a way to silence the noise. You are one busy woman. Hard work pays off! Congratulations! The neighbor is very nice in all other ways, so I really have nothing to complain about. I just had to figure out a way to manage the noise. Merry Christmas to you as well, Yolanda. And I hope 2019 is a beautiful year for you. You, keyboard, monitor … a very minimalist approach indeed! I have to add in headphones, pen and notepad, and usually a drink of some sort, but not much in the way of clutter. I do have to admit to some piles of “TO DO” stuff at the side. I would have to get noise cancelling devices if my neighbors took up leaf-blowing as well. As it is, sometimes, their chickens and rooster startle me during the summer when I have the windows open – the hens cackle proudly off and on, with no warning. I don’t know if they’re telling each other off, or if they are bragging on eggs they just laid, but I think they’re louder than the rooster. I loved reading about everyone’s objects – it’s been interesting. Isn’t it interesting to know what people cluster about themselves at their writing spots? I didn’t think this question would be interesting, but it turned out to be very interesting. I love the sound the sound of morning roosters. Great, Mark. Nice to keep expanding your circle. I usually have to write in silence, but the steady drone of a leaf blower might not be so bad, provided the sound didn’t make me feel guilty about not cleaning up MY leaves. I think it’s the constant and unpleasant drone that gets to me. Other noises are a problem. I hopped over and voted. Good luck. Thanks for your vote. I’m enjoying the competition. Love the plot bunny whenever it hops by. Yes, this leaf blower could be another character in the future. You have a charming cover, and I voted for it in the Cover Wars. Hi Olga. Thanks. I’m pleased that someone with an artist’s eye likes the cover. Love your quote of the month. So fitting for me right now. Good luck with Cover Wars. I’ll be voting for you. It’s a good story; hope the cover gets lots of love. Many blessings in the new year, C. Lee! And holiday blessings to you as well. Let’s look forward to many successes ahead. And thank you so much for your vote. Love the quote. So true. Your cover is great. It’s way ahead in the poll. Best wishes. Thank you, Diane. I haven’t checked the polls yet, so this is amazing news! My neighbor always manages to mow his lawn when we have people over in the summertime. And, as I’m writing this, that same neighbor is snowplowing his driveway, which has to be done, but not at 5 in the morning or in the middle of the night to catch up on the snow…wakes my kids up in that front bedroom. I also like complete quiet when I write. A little background noise doesn’t bother me too much, but the house has to be silent. I never thought of getting ear silencers. I tried other things, but these silencers have been the best solution. You really get noise bombed during all seasons. I’d invest in a pair of silencers if I were you. Here’s to a wonderful 2019 for you and those you love. Great cover, great quote. I wish you a happy holiday season, and all the best for making some new memories while still cherishing the old ones. Glad you liked the quote. I return the holiday greetings an look forward to seeing you more in 2019. Hi Lee. I’m having fun trying to comment today. WP keeps telling me I’ve already commented. Hope I have more luck this time! Glad to see you signed up for WEP. Should be fun! I hope you win the cover wars. Have voted several times. Many thanks for the votes, Denise. As to WP…it gives me fits all the time. I know it’s a more powerful blogging platform than blogger, but it isn’t very friendly. Voted. Happy IWSG Day. Wishing you lots of luck. I really appreciate your vote, Juneta. Thanks so much. Have a wonderful holiday. Voted today, will go back tomorrow. Writing myself a reminder. The advantage of living in the country, no close neighbors. I can see my nearest ones house, but there is space between us. I suppose that’s why I’m grousing. If I lived in town I might not notice the noise, but I live where it’s supposed to be quiet. Thank you as always for your support, Beverly. We have hung in there for a while. The leaf blower is the living symbol of the 21st Century, blowing your problem into someone else’s space in the loudest way possible! Sigh. May so happy resolution come to you for this. Happiest of Holidays! You have said it perfectly. But I expected that. Love that cover. I’m off to vote! Many thanks, Melissa. Loved your Christmas decorations that you posted on FB. I need to get busy. I read your newsletter. Your Thanksgiving sounds fascinating. Hope you’re holding up okay during the holidays. So many memories, and heartache when you’re missing someone. Thanks for all your support and hard work. Your books and writing are great. I look forward to reading more of your work. My plan is to break with all of what used to be and create a different holiday. I treasure the memories of the past, but I need to create new ones. Everyone has a different way of managing a significant loss, and I guess this is mine. Hope it works. You are one busy guy, Roland. Hope you’re a holiday isn’t all about work. Thank you so much for your vote. Every time I visit someone new, I hope to find a new connection. It’s kind of exciting, isn’t it? I love your list of favorites Lee. Coffee, water and wine 🙂 The cover is great! I love the colors and how the green is worked in so well. I’ll hop over and vote. Thanks, Erika. We could get along with our favorites matching so well. Thank you for voting. Love that cover! And that quote! You got my vote. Many thanks, Jennifer. It’s one of my favorite covers out of all my books. I love that quote – definitely perfect for my classroom wall!! Those probably have a different DB range. Maybe they’d be easier on my old ears. Glad to feature you this month, and glad you enjoyed it. OH EM GEE. Loud neighbors. Mine love to blast music at all hours. I’m just about to the point of calling the police, but I’m trying to be mindful of my pretty cool landlord too. Guess I need to call him again. Well, good luck with those neighborly noises. Maybe your landlord will come through for you. I hope so. And just voted for your cover. It’s awesome! Thanks, Natalie. It’s great to have supportive writer friends! Love the quote. I have a simple work space too. Maybe I’ll have to add the wine though. Hope you are able to enjoy the holidays. I’m breaking the traditions this year and trying to make a fresh start. I’ll keep the memories of all those other years, but make some new ones. I know you’ve been at this for a while longer, but I also know that doesn’t necessarily make it any easier. Thinking of you. I’m considering counter-leaf-blowing strategies. This could mean war! Thanks so much for your vote. Having the essentials to write sure is a win indeed. True quote indeed. You learn a whole lot more from losing than you do from winning most times. It’s a comfort to think that way. Of course, I could point out that I’m really very learned, and then you’d understand my list of losses is quite long. Voted! 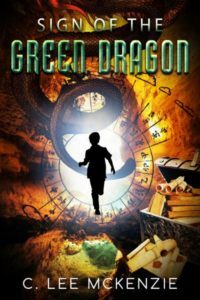 Best of luck with the contest… Regardless of the outcome, Sign of the Green Dragon is truly a wonderful story, and the perfect Christmas present for any young (and old!) readers! I hope you have a happy, peaceful holiday season! Many thanks, Erin. Your comment made my day! Voted! And visited Jemi’s blog! Sounds like you’re busy. Hope the new year brings you much love and happiness. Thanks for stopping by, Lisa. Always great to see you here. That’s interesting. I guess I should stop by and check the status. Thanks for telling me. It’s always louder when you’re used to quiet. Good luck with that. I may need a pair of those headphones myself. I strongly suggest a pair when you need to concentrate. Living on a tree-line street, we have our share of leaf blowers, too. I turn up the volume on RainyMood.com until they stop. Your drinking schedule mirrors mine exactly, except I prefer Scottish or English tea, with a piece of shortbread. Scottish tea? How is that different than English tea? I’m not a huge tea drinker, so my knowledge of it is limited. Good plan on RainyMood.com. I might give that a try. Ha Ha! With the name McKenzie, I thought you might be into your Scottish heritage. Seriously, it’s just about the brand. I drank the French Mariage after my trip to France. And having returned from Scotland, I’m all about their Edinburgh tea. They have a great whisky tea, as well. England has several of their own brands, one of which is Taylor, that I love. The Scottish tea is said to be stronger, which I like, because I do the honey and milk with mine. So here’s the surprise, Lee. I married a McKenzie. I’m a Swiss-Italian/Irish person. We do not do tea, so I’m clueless. However, I am acquiring a taste for many varieties. A strong tea sounds like something I can do. 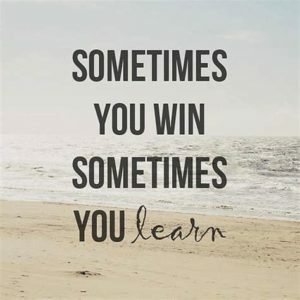 Learning is ALWAYS a win. Sometimes painful, but a win just the same. Looking forward to reading yet another of your books (in the fullness of time). You’re so right about learning. I am very happy that your books have found a home in Carmel. I have been their several times and I love Monterey. I also love you quote. There is some deep wisdom in those words if we open the eyes of our heart to see it. Wishing you a Merry Christmas, Lee. If you visit our area again, give me a heads up! Imagine, talking face-to-face after all of this blogging exchange! May your holiday be beautiful, too, Pat. I’m pretty sure that it’s justifiable homicide if you stuff the leaf-blower up someone’s backside. Seriously, those things ought to be banned. I can only hope that you soon get snow or something to cover up the leaves (and then she’ll haul out the snow blower. I know). I’ve had my murderous moments, Rebecca. So far they’ve only been thoughts, and I think my headphone approach may keep me out of prison. Argh, that story about your neighbour made my blood boil, just reading about it. Why do so few have any consideration for others? I’m also at the mercy of neighbours who let their dogs bark all day. Lately, it’s been quiet, which is a blessing, but during the summer, it’s nothing but bark-bark-bark. I used to like dogs, but the ones in this neighbourhood have turned me off completely, even though it’s mostly their owners’ fault for not training them (or just leaving them outside and ignoring them all day). Hoping you have a great holiday, Lee. Wishing you well. The dog barking seems to be among common annoyances. I once called a neighbor to ask if they’d put their dogs inside while I did a podcast. The first time I did one, the interviewer asked if I owned a kennel! Happy holidays to you and many more super stories in 2019! Have you ever seen the movie “Authors Anonymous”? There’s a scene in it that I think will make you snort-laugh. I won’t tell you which one, but you’ll know when you see it. I’ll look for it. Love the title. “she blows a lot”– double entendre? 😄 I don’t understand “blowing off the driveway”, I have a neighbor that started to blow out the garage. What happened to the good old broom? It’s so peaceful, doesn’t pollute the air and annoy neighbors! I should point out how much exercise she’d get with a solid push broom. However, I doubt that would have much effect. Oh well, it is what it is. Have a great holiday, H.R. That leaf blower would drive me batty. I’m happy my neighbors are gone all day on the weekdays. Wonderful quote. 🙂 Voted! You are lucky. A quiet environment is important to everybody! Thanks for your vote! Our neighbour is always doing stuff outside, and she has lodgers so there’s always different people coming and going. The main problem is it annoys our dogs. The noise silencers sound great! I’ll bet they bark, right? I wish I could bark when that thing goes on and on. I “hear” you when it comes to loud, disturbing noises like leaf blowers. Such sounds derail my thought process and bring writing progress to a halt. The quote of the month is excellent! Merry Christmas and happy new year to you, dear friend Cheryl-Lee! Oh, thank you for that boost. And thank you for stuffing the ballot box in my favor. May you also have a wonderful Christmas and I hope we stay connected in 2019. Our neighbor is always in his backyard doing something. I hope he never buys a leaf blower. If he does, I have an extra pair of noise dampeners. I’ll send them your way. I can’t believe how fast 2018 went by, but we plug on. One moment at a time, right? They do add up quickly to become a year. Just voted and it looks like you are neck and neck for the lead! Good luck and I hope the Green Dragon wins. It’s such a fantastic cover. I need some of those noise eliminators – great idea. Take care, Lee! Thanks so much, Julie. I love Cover Wars. It would be fun to win. I like the idea of noise eliminators! May the final month of 2018, after what having been a terrible year for you, be a blessing. I do make a statement when I wear them. It’s just not high-fashion. Thanks, Jeff. What is it with people like that? Give the driveway a break, lady. I know. It has become an issue. Heaves a sigh! Thanks for your vote.